It has long disappointed me that I was unable to try Grill'd's chips, hailed as delicious and amazing, but coated in beef tallow before they were fried (groosssss). So it was with delight that I recently heard the news that all the chips in all of Grill'd's stores are 100% vegan. So of course I raced out to try them (accompanied by Fi). They are chunky. And salty - giant globs of salt. And very herby. 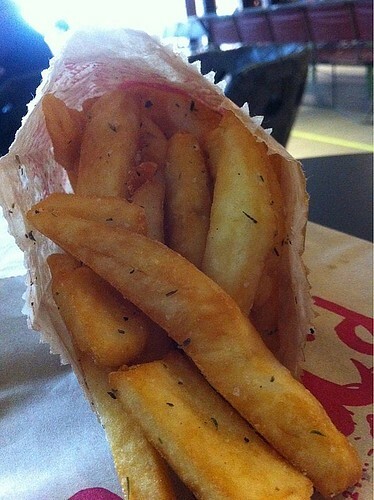 Not the best chips in old Melbourne Town, but pretty tasty! Really, truly? This makes me very happy! I might even buy some tonight. Yes, apparently! I read about it on Vegan Aussie Food Updates, so I hope they're not wrong as I've now eaten them! I just looked at their official website and it has definitely changed. It previously said 'not suitable for vegetarians' in the FAQ and now lists the chips as vegan. Yay! last time i went they let me know that they weren't vegetarian but would be as of the following week. i was very impressed and grateful that they told me. i need to try them now! This makes me happy! I was really upset when I learned they weren't because I had actually eaten them once or twice before a server actually told me. I was upset that they hadn't told me before! And when she said "they aren't vegan", I said "are they fried in beef tallow?" When she responded yes, I was like, "You do realise that makes them not vegetarian either, right?" I can't understand why that doesn't compute for some people! Now I am spoiled with chips option when LoTF and Grilled are on both sides of the street!! I must admit, I'd always figured if chips were cooked in vegetable oil they would be vegan. More fool me! Thanks for the heads up and the good news re: Grill'd.